Is a Freshwater or Saltwater Aquarium Right for Me? Unless you live near the sea, you’ve almost certainly never seen a shark or a manta ray or a swordfish swimming around near your home, except maybe at an aquarium. And you probably already know the reason: freshwater bodies and saltwater bodies are radically different, and any given type of fish can only survive in one or the other. Fish that live in the ocean can’t survive in freshwater lakes and rivers, and vice versa. So, it follows then that if you’re building an aquarium, it’ll have to either be saltwater or freshwater, and will only be able to have saltwater organisms or freshwater ones—not both. With that in mind, for the prospective hobbyist who’s thinking about getting a tank and getting into the world of aquatic animal husbandry, there’s an important decision to be made: should I start with a saltwater aquarium or a freshwater aquarium? Saltwater aquarium maintenance differs from freshwater aquarium maintenance in some key ways, including costs, risks, and workload. Here’s some information to help you weigh your options. For a more comprehensive guide to designing a custom tank, click here. The first thing that a person picking up any new hobby will consider, of course, is how much of an investment it’s going to be. And in this regard, there are some key differences between freshwater and saltwater tanks for you to make note of. The first thing that contributes to the cost of the aquarium is the organisms themselves with which you’ll be filling it. Here, there’s a pretty clear disparity in pricing. Many freshwater fish cost $5 or less: approximately $3 for bettas and goldfish, tetras and gouramis for about $2, and cichlids for about $5. Saltwater fish on the other hand can cost far more: prices range from $15 for dottybacks and $20 for blennies to $30 or clown fish and $75 for butterflyfish. The plant life also has a price disparity, with freshwater plants costing $2-$25 while coral and saltwater plants can range from $50 to $250. Saltwater aquariums also require more equipment which contributes to higher startup costs as well. Factoring in the tank itself, the gravel to use as substrate, a power filter, a regular fluorescent aquarium light, food, nets, scrapers, a quarantine tank, and test kits for pH, ammonia, nitrite, and nitrate, the total startup cost for a reasonable freshwater aquarium totals about $270. A saltwater aquarium though also requires power Heads for water movement, a protein skimmer, a hydrometer, salt mix, live rock, sand (a more expensive substrate than gravel), and additional test kits for calcium levels and alkalinity. This puts the total for a saltwater tank at approximately $635—and if you decide to create a reef tank, it’ll be twice as much. 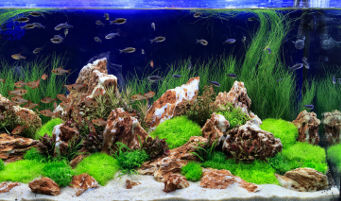 Of course, there are always ways you can really invest in your freshwater tank and bring it up to prices comparable to a saltwater tank—for example, if you have a lot of plants, you’ll spend more on lighting and fertilizer. And if you have a bit of experience, you can probably find diy solutions to many of the equipment expenses for saltwater tanks as well. Those solutions, though, mean more work. And that tends to be somewhat true of saltwater aquariums generally. Freshwater aquarium maintenance is typically less involved than saltwater aquarium maintenance. All that extra equipment needs extra care to keep it functioning properly. But there’s also the work of making your saltwater aquarium, well, salty. Before you can perform the task of changing water, which with freshwater tanks is fairly simple, you need to let salts dissolve in the water for days beforehand. The salt dissolves slowly and you need to check the salinity with a hydrometer. You could make the process easier by setting up a system where the water is continuously mixed in a large bucket where a heater heats it and a powerhead circulates it, but putting that together takes time and effort as well. And you can buy saltwater from a supply store, but that also adds cost of saltwater aquarium maintenance. Saltwater fish are also harder to breed, so an inexperienced fish breeder may have trouble getting them to mate than they would with freshwater fish. In addition to that, you need to keep a closer eye on the more sensitive organisms in a saltwater tank. There are more water tests to be done, and you need to watch out for “stowaway” organisms that often come along with the live rocks and live sand that you should be adding to a saltwater tanks. Some of these can make positive contributions to an evolving tank but require changes in treatment, while other can be harmful and require removal. A freshwater tank rarely has this element of random change, so in that regard as well saltwater aquarium maintenance can be more unpredictable. That extends to more than just those organisms though. Saltwater organisms are generally more sensitive to all sorts of conditions, from water salinity to calcium levels to heat and light levels and more. 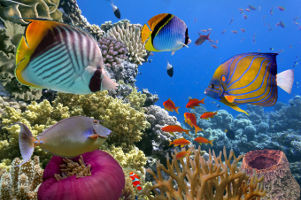 Not only that, but the sheer range of the types of organisms available, including corals, cephalopods, mollusks, crustaceans, and more, is much larger for saltwater organisms—after all, the oceans are vast and deep, and there are hundreds of distinct ecosystems contained within them. Therefore, curating a collection of organisms that are all compatible with one another, and all compatible with similar aquarium conditions—and then delivering an environment where they can all flourish—is a complex and delicate task. You never know when two fish are going to be aggressive toward one another, or when one fish won’t want to share the reef space or the food because you haven’t supplied enough. So because saltwater aquarium maintenance is more intensive and unpredictable, and because the startup costs and potential risks of a freshwater aquarium are smaller, a freshwater aquarium is generally a better option for someone’s first aquarium. Starting small is a good way to develop your expertise before you go on to tackle the more complicated, pricier, riskier challenge of a saltwater aquarium. But we’d be dishonest if we didn’t admit that saltwater aquariums reward you for the extra time, effort, and investment. Saltwater aquarium maintenance can be a pain, sure, but it’s all worth it when you get to enjoy the brilliant, active sight of a well-designed and well-maintained saltwater aquarium. That diversity, with corals and all the rest, can create brilliant splashes of color, and exciting dynamics between livestock, the likes of which you can’t quite replicate with a freshwater aquarium. But whether you’re starting off with a freshwater tank, or if you think you’re ready to take on saltwater aquarium maintenance, you’ll need an expert to help you get set up. Living Art Aquatics has been the premier designer and supplier for residential and commercial aquariums in Crystal Lake for twenty years. We’ll even install your aquarium and help you maintain it if you need help. Simply give Cory a call at (847) 737-5151. We’ll help you dip your toe in the water and get you acquainted with everything you need to know. Because for us it’s more than a hobby—it’s an art.